Synthwave is one of those genre’s everyone can just kind of get behind. Evolving bass-lines, grungy, bright lead synths, heavy drums and many more elements make up a genre that leaves the listener feeling like they’ve been told a story. 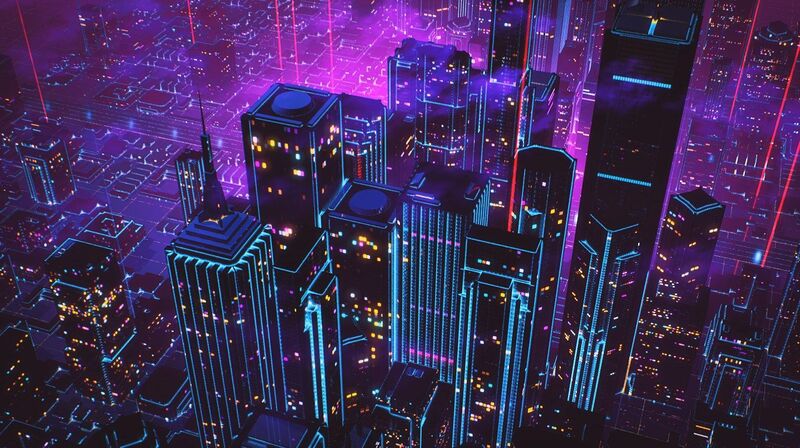 Synthwave originated in the early 2000s in various niche communities and grew exponentially, gaining popularity among many in 2010 with the emergence of various french house artists who were creating music based on 80’s film score (Neuman, 2015). As a genre, synthwave basically explores 80s nostalgia, as well as futuristic ideologies and viewpoints and combines the two. The music’s aesthetics engage in retrofuturism, emulating 1980s science fiction, action and horror, then expressing nostalgia for it by trying to capture the era’s atmosphere and celebrate it in a futuristic sense, often compared to cyberpunk. This futuristic depiction of 80s nostalgia is often represented through the album art that goes alongside many synthwave tracks. It is also represented through the published media that include synthwave tracks including games, movies and various other media formats. Below are some examples of synthwave art. This aesthetic is also portrayed in various pop culture movies and games as I said before. Movies like Tron and Blade Runner 2049 all explore 80s nostalgia in a cyberpunk, futuristic sense with the use of synthwave. Have a look at these examples and see and hear how the two gel together. This game is another example of a synthwave based media product. The music evolves and adapts to the game, and the aesthetics of the game are extremely synthwave based. Some other games that achieve the same goal are Hotline Miami and Outrun, a game that was considered a great inspiration for the genre. Anyway, back on track, Synthwave as a genre is usually created in a 4/4 time signature with a BPM of anywhere between 70 (on the low end of the spectrum) to 160. There are also several key elements to synthwave music, including drums, synth pads, synth keys and synth bass. Vocals, guitars and any other elements are optional, but may take away from the track if too heavily focused on. There are also several general rules you will want to follow in the creation of synthwave. The snare should usually be low-mid heavy and very punchy, full sound. To achieve this sound, it is best to record the top and bottom of the snare, with the bottom mic being the loudest. Playing the snare on every 2nd and 4th beat as half notes is generally the way to go. The kick is very much up to you and how you want your track to sound, but generally, it is one of the driving forces of a synthwave track. Therefore, it is important for it to be heavy and a little bit woofy so that it has feel. As for other percussive elements like hats, toms, etc. it is really up to you, however, it is suggested that heavy reverb is applied to get them sounding more present within the mix. A simple progression with great chorus and arpeggios are your best bet, as they add depth and harmony to the track. Pads are extremely important in a synthwave track. There are layers upon layers of them to make the track full, sweeping and droning. It is totally up to you what kind of pads you use, but a general tip would be to use a mid and low range droning type thing so as to capture some really nice mid and low frequencies. Layering these will also ensure the track sounds nice and full. Arpeggiated bass-lines were a classic 80s trope and are very often present within synthwave tracks. The bass-line is extremely important to the mix as, alongside the drums, progresses the track. A pulsing bass is usually best, however playing around with modulation and arpeggiators can get you some really interesting sounds. Overall, synthwave is a genre that brings great nostalgia to many people and is very successful at making people feel things (Yep, just things). It’s use in media is generally always in a futuristic sense, and this adds to the cyberpunk aesthetic that synthwave brings. I hope you enjoyed the blog and learned something about the genre.